How Will Akron Work to Beat the Epidemic in 2018? Sunday night shows are usually really awkward, so I try to avoid them. This particular Sunday night at Annabell’s Bar & Lounge grabbed my attention, only because I wasn’t ready for weekend to end and I saw familiar names in See Creatures and Actual Form. I’ve seen both bands live already but just enough that catching them in the grungy understructure at Annie’s (heard someone say that) wouldn’t make my night feel wasted. I hadn’t heard of Daikaiju (pronounced die-kie-joo) yet, and I soon learned that this would be another experience that is engraved into my skull for all eternity. When I get asked, “Have you seen these guys?” before a show as many times as I did this one, I’m usually underwhelmed and silently judging everyone that’s drooling over whatever we’re watching. The expectations were set so high that I almost wasn’t paying attention to Actual Form during their set, but luckily they made me pay attention. I was also writing notes on how I paid a cover for the first time at Annabell’s, and why they never seem to do that, but that’s a conversation for another day. Actual Form’s heavy Prog Punk sound was a gripping head-trip against the stone floors and cinder block walls that make up the room. They don’t waste time with introductions of the band or tuning that makes you wonder why they didn’t do it before the show. Ian Cummins was an absolute animal on drums: think Animal from the Dr. Teeth and The Electric Mayhem band, but not in a condescending way. Bassist Matt Haas was more the showman, mildly charismatic but effective in stage presence. His and guitarist Josh Novak’s riffs whizzed in and out of time signatures I couldn’t even count. There were no vocals to any of the few songs they played, and they wouldn’t fit anyway. Actual Form fills every space possible in every moment of their songs, which creates an experience, rather than a practice session, of how technically good they are with their instruments. 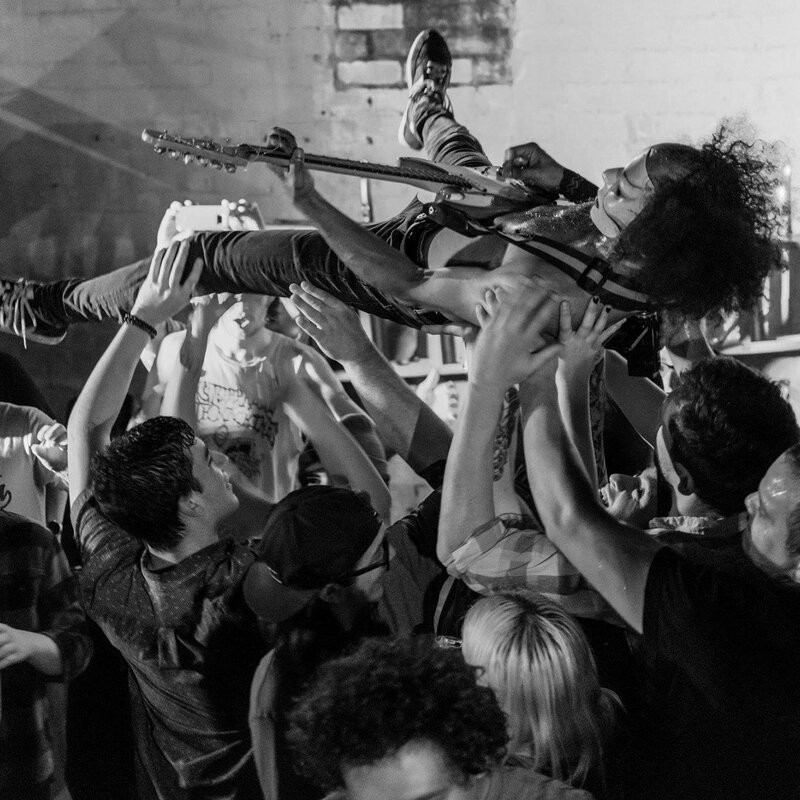 See Creatures is an unexpected party band. I’ve mentioned before how impressive it is that their sound is so full for only being a two-piece band. They had us all dancing within three songs, specifically a group of obviously new 21-year-olds (I couldn’t tell if I’m old now or they were just really drunk). A thin cloth was draped over the mic, which added a dreary effect to Nate Bucher’s vocals. The atmosphere set around See Creatures’ psych rock tunes was like a sonic guide to lead you through famine in the desert. Whether it was their intention or not, the first two sets seemed to zoom by out of respect for the touring band’s time. The room went from 50 to 80 people or more in a matter of minutes, and four emaciated-looking guys in tribal masks took the stage. The room transformed as the audience went from watching bands play to being a part of the show. There was no introduction (I’m assuming so the band could stay in character), and Daikaiju (which means “a larger variety of monsters” in Japanese) bellowed into a non-stop set of surf/punk/prog songs. There were no vocals other than shrieks of rage during a bridge here and there. Then drummer Blast-man started moving his gear into the crowd while only a looping bass effect occupied the air. Guitarists Rock-man and Secret-man and bassist Pulse-man moved their amps from the stage into the crowd with audience assistance. This plan continued every song or two as the room started to feel like we were watching a battle royale. At one point Pulse-man was on the bar asking for a shot and after he took it, he crowd surfed while playing back to the middle of the crowd. Their final stage was set at the edge of the bar where lighter fluid appeared and was sprayed on the cymbals, which set them ablaze while Blast-man (and anyone who grabbed a drum stick afterwards) pummeled them. 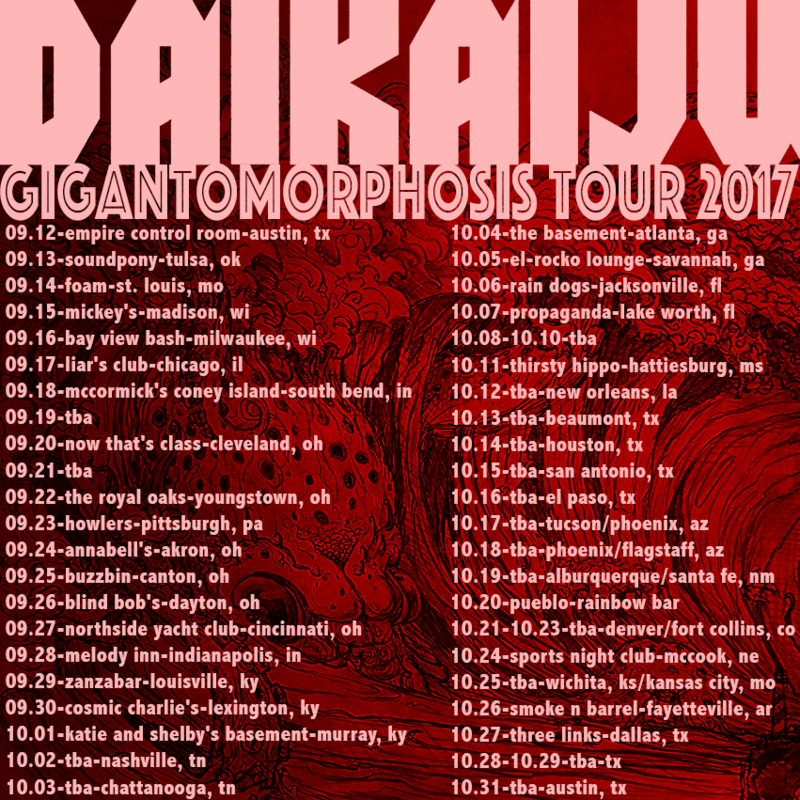 Daikaiju flawlessly brings their persona to life on stage. I think I had NIHL after the show because all I heard was a consistent hum that I felt in the middle of my skull. It felt like I just witnessed a war on our city that we almost lost.